DNA methylation is a covalent modification of the cytosine ring at the 5' position, resulting in 5-methylcytosine (5-mC). In somatic cells, 5-mC is found almost exclusively in the context of paired symmetrical methylation of the dinucleotide CpG. The biological important of 5-mC as a major epigenetic modification in phenotype and gene expression has been recognized widely. Quite recently, a novel modified nucleotide, 5-hydroxymethylcytosine (5-hmC), has been detected to be abundant in mouse brain and embryonic stem cells. It is a hydroxylated and methylated form of cytosine. Although it is still uncertain its specific role in epigenetics, it is believed it plays a role in DNA demethylation, chromatin remodeling and gene expression regulation. Abcam's Hydroxymethylated DNA Quantification Kit (Colorimetric) (ab117130) is a complete set of optimized buffers and reagents to quantify global DNA hydroxymethylation by specifically measuring levels of 5-hydroxymethylcytosine (5-hmC) without cross-reactivity to methylcytosine and unmethylated cytosine. It can be paired to use with Methylated DNA Quantification Kit (Colorimetric) (ab117128), which specifically quantifies 5-mC, for simultaneously quantification of both methylated and hydroxymethylated DNA. 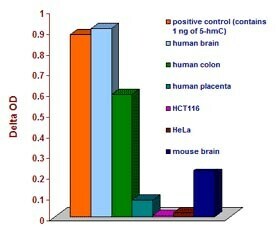 Demonstration of a high abundance of 5-hydroxymethylcytosine in human brain and colon tissues. 200 ng of DNA isolated from different tissues or cells were added into the assay wells and the hydroxymethylated fraction of DNA was measured using the ab117130. OD intensity measured in variety of DNA samples. Demonstration of high specificity of 5-hydroxymethylcytosine detection achieved using ab117130. Synthetic unmethylated DNA (contains only cytosine), methylated DNA (contains only 5-methylcytosine), and hydroxymethylated DNA standard (contains only 5-hydroxymethylcytosine) were added into the assay wells at different concentrations and then measured with ab117130. 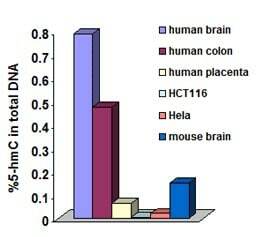 Demonstration of a high abundance of 5-hydroxymethylcytosine in human brain and colon tissues. 200 ng of DNA isolated from different tissues or cells were added into the assay wells and the hydroxymethylated fraction of DNA was measured using ab117130. Percentage of hydroxymethylated DNA in various tissues and cells. Demonstration of high sensitivity of 5-hydroxymethylcytosine detection achieved using ab117130. Synthetic hydroxymethylated DNA was added into the assay wells at different concentrations and then measured with the ab117130. Publishing research using ab117130? Please let us know so that we can cite the reference in this datasheet. I am interesting to analyze the methylation and hydroximethylation status of my samples (adherent cells) and i found our products: ab117133 and ab117135. Are these kits suitable for RT-PCR analysis?Do the 24 or 48 tests correspond to 24 or 48 single immunoprecipitations?For example, if i have to analyze two different cell type, i have to consume 6 tests (two for 5mc, two for negative control IgG and two for imput DNA)?And finally, I am interesting to hydroximethylation, so do you have similar kit for this modification?If i purchase the anti-5-hydroxymethyl Cytidine antibody (ab106918), i could use this antibody and so different negative control (in place of Anti-5-methylcytosine and mouse IgG) with the same kit? Both of these kits (ab117133 and ab117135) will immunoprecipitate methylated DNA. The ab117133 Kit uses purified DNA as starting materials while the ab117135 Kit uses cells as starting materials. I can confirm that the immunoprecipitated products are suitable to use for RT-PCR. The 24 or 48 tests correspond to single immunoprecipitations and not to the number of samples that you are able to assay. Therefore, if for one cell type you need to do 6 tests, then you will be able to run 4 cell types with a 24 sample kit. The kits are in strip format though, so you can save what you don't use for a later time. With regards to a hydroxymethylated DNA kit, we have https://www.abcam.com/episeeker-hydroxymethylated-dna-quantification-kit-colorimetric-ab117130.html, Seeker hydroxymethylated DNA Quantification Kit (Fluorometric) (ab117131) or https://www.abcam.com/episeeker-hydroxymethylated-dna-immunoprecipitation-hmedip-kit-ab117134.html. The more suitable kit would depend on what type of information you want from your samples. The ab117130 and ab117131 kits will allow you to look at global hydroxymethylation levels of their samples and would tell you the percent of hydroxymethylation of your DNA but would not allow for RT-PCR. The kit ab117134 will allow the you to explore regions of hydroxymethylated DNA by immunoprecipitating/enriching the hydroxymethylated DNA followed by RT-PCR or hMeDIP-chip which is maybe more useful to you. You can indeed purchase the anti-5-hydroxymethyl cytidine antibody (ab106918) and use it with the 5-mC immunoprecipitation kit since you coat the antibody on the wells. I am very interested in yourEpiSeeker hydroxymethylated DNA Quantification Kit. I want to know what kind of genomic DNA aresuitable for analysis of this kit. The genomic DNA what I want to analyze is fragmented DNA by sonication. Can your kit deal with this kind of DNA? Thank you very much. This kit can be used for the DNA fragmented by sonication. The kit is tested with various size of DNA and suitable for the size from 150 bp to intact genomic DNA. I found there are 2 related Question about EpiSeeker hydroxymethylated DNA Quantification kitsavailablein your website, one is Fluorometric version, anotheris Colorimetric version. I want to know what the major difference are between these two kits. What are their advantages and disadvantages respectively? How should I select among them? Thank you very much. Thank you for contacting Abcam regarding our EpiSeeker Hydroxymethylated DNA Quantification kits. The main difference between the colorimetric and fluorometric kits is the method of detection - this will require either a microplate reader at 450nm or a fluorescence microplate reader at Ex/Em = 530/590 nm. I hope this information is helpful. Please do not hesitate to contact me if you have any additional questions.